It’s fitting that I’m writing this on a train from Bonn to Stuttgart. I’m heading to #WOLCON18, a joint event organized by Bosch and Daimler for 400 of their employees. I’m often asked, “Why is WOL big in Germany?” I usually respond that there’s nothing particularly German about the method. It’s just that Bosch, based in Stuttgart, was the first company to embrace it. That was three years ago, and they ignited a trend in their home country. Since then, they spread it to employees in over 45 countries, and WOL is now in a wide range of organizations around the world, from corporations and non-profits to schools and governmental groups. Almost from the beginning, local communities sprang up where people would share their experiences with WOL or look for Circle members. (These are in addition to the WOL groups I created on Facebook and LinkedIn.) There’s a Yammer group in German, and a @WOL_de Twitter account. There was also an early attempt at a German website that proved difficult to maintain, and having up-to-date information was my main reason for finally making workingoutloud.com bi-lingual. For sure, these groups help raise awareness and create a sense of connection for German speakers, and I’m grateful for that. I’m also grateful to Claudia Kaspereit for her translation work on the website, and to the Bosch team for the first-ever WOL translation of the Circle Guides a few years ago. Having the website available in another language is just a small, long-overdue step. But each time WOL content is translated into other languages - the Circle Guides, journals, book, subtitles on videos - we are able to reach more people. That makes each step worth it. 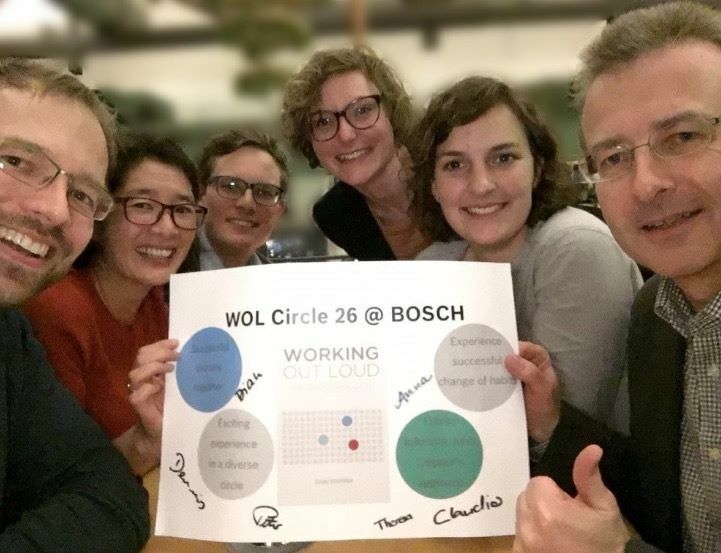 Thanks to the heroic efforts of Katharina Krentz and Monika Struzek at Bosch, the Working Out Loud Circle Guides are now available in German. Many of my German friends pride themselves on being “direct.” So I was particularly pleased when Katha told me “These are the best guides ever! We love them!! !” In this upgrade, I improved the flow, completely reworked some of the later weeks, and included more exercises and resources. They are simpler, clearer, and more complete. Of course, you are the best judge of whether these Circle Guides are effective. Try them, and let me know what you think. What did you like best? What could be improved? Thank you for using these guides and for any and all comments. And a heartfelt “Vielen Dank” to Katha and Monika. Your contributions and support, and those of the entire co-creation team at Bosch, have inspired me to be and do more.